Rugby is becoming more and more popular as a spectator sport in the United States. With a high concentration of international students from rugby loving countries, the popularity of rugby at Tech has also increased significantly. As rugby has grown in popularity, the rugby teams at Tech have also experienced growth, women’s rugby especially. The women’s rugby team at Tech placed in the top 16 on a National level for both 7’s and 15’s last season. The team had a 6-0 record in the North Division One South Independent Conference and went on to finish second in the conference. After experiencing so much success last season, the team is looking to take things to the next level. “I know we are really trying to focus on going varsity in the next year or so,” said fourth year BME and flanker Chidinma “Chi-Chi” Chukwueke. Moving up to the varsity level will not be without difficulties for the women’s rugby team. Last season one of their head coaches left just before playoffs. This season the team has been looking for a new coach that will guide them in successfully debuting as a varsity competitor in women’s collegiate rugby. Varsity women’s rugby has been growing at the collegiate level, and Tech’s team is capable of making the transition pending funding and maintaining consistent talent coming in every year. There are currently 10 NCAA varsity women’s rugby teams including Harvard, Brown and Life University. “It is hugely expanding. Every year there are new teams that pop up,” said fifth year BME student Lara Gartner. Gartner also plays for the Atlanta Harlequins, a club team in Atlanta, ranked fifth in the US. 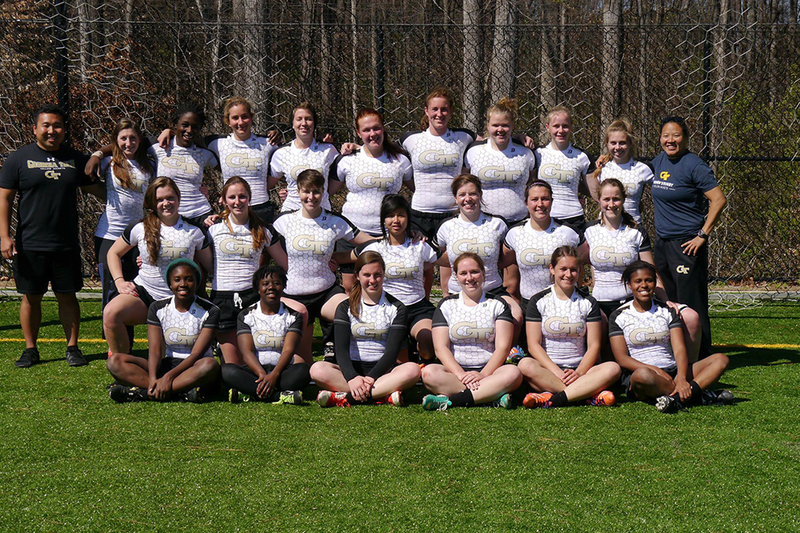 The women’s rugby team at Tech offers lots of opportunities for its members to move up. Gartner is only one of many players who left Tech to go onto other rugby positions. Gartner had many positive things to say about the ways in which Tech’s women’s rugby team helped prepare her for a WPL team position. Providing a rugby network of alumni and local teams for players to take advantage of at the collegiate level and beyond is only one way that the women’s rugby team helps their players. The team does a lot to make sure that rugby players are supported in continuing to have high academic performances as well as exceptional performance on the field. “I make myself work in the mornings. Work, lunch break, and then I have all my classes in a block in the afternoon, and then in the evenings I have rugby, group meetings or I get to study. And then at night I take a few hours for downtime because if I don’t, I’ll explode. We have study parties after practice. We really care about each other and so we try to take care of each other and pull each other up as best as we can,” Chukwueke said. Both Chukwueke and Gartner were named to the 2014 USA rugby Women’s Collegiate All-American team this past year. Gartner was first team, and Chukwueke was second team All-American. Chukwueke was also a second team member in 2013. Rugby, being a contact sport, seems to be a sport that might bring more stress into Tech’s students’ lives. In fact, having to balance any sport, varsity or club, with academic performance sounds stressful. Many people know rugby as a dangerous contact sport and might think that possibility of being injured playing rugby adds more stress to student lifestyles. However, for many rugby players, rugby becomes an outlet for stress. “Don’t be afraid to try it. If you think about having fun, you’ll forget to be afraid. Plus tackling someone after a physics test is a great catharsis,” Chukwueke chuckled. The upcoming season will be crucial for women’s rugby at Tech. Last year the team made it to the first round of the 2014 Women’s D1 College National Championship where they lost to the eventual third place winner, Westchester, 63-26. Penn State won the national championship where they outscored opponents 293 to 15 over four games. The team hopes to continue expanding in numbers and skill and in the women’s varsity collegiate rugby community as they continue on their quest of becoming a NCAA varsity program.